A Florida boatbuilder - with financial support from singer Jimmy Buffett - is building at least four fiberglass flats boats modified to rescue wildlife from oil-soaked marshes along the Gulf Coast. "Two days after the explosion, I thought, if this stuff ever moves into the marshlands and the estuaries it&apos;ll be a nightmare scenario," says Mark Castlow, owner of Dragonfly Boatworks in Vero Beach, Fla., and the designer of the 17-foot rescue boat. "Our business is shallow-water boats. It&apos;s something we know and we knew we had to do something." Castlow called Dragonfly sales manager Jimbo Meador with his idea. Meador happened to be fishing in the Bahamas with his longtime friend Buffett. "Mark ran it by Jimmy, and he really liked the idea and he said, &apos;Let&apos;s go ahead and start building some of these boats,&apos; " says Meador, 67, who grew up with Buffett on the Gulf Coast. "[Buffett is] always interested in doing what he can for the environment, especially the marine environment, because his life revolves around water, especially salt water. The Gulf is his own, you know, so he&apos;s particularly interested in that." Buffett is funding the construction of four Shallow Water Attention Terminal, or SWAT, rescue boats. The first was delivered in June to the University of Southern Mississippi&apos;s Gulf Coast Research Laboratory in Ocean Springs. (Buffett is an alumnus of the university.) Specialists with the National Fish and Wildlife Foundation will use the boat to rescue oil-coated birds and other wildlife. The project was delayed for a couple of weeks because BP&apos;s Incident Command Center told the Gulf Coast Research Laboratory and the Castlow team they were prohibited from using the SWAT boats to rescue wildlife. "What we&apos;re having to do is deliver these boats to these different locations, and then we&apos;re getting Fish and Wildlife people onto the boats," Castlow, 58, said in early July. "That was one of our stumbling blocks - we couldn&apos;t get anybody who was actually licensed to touch oiled wildlife. 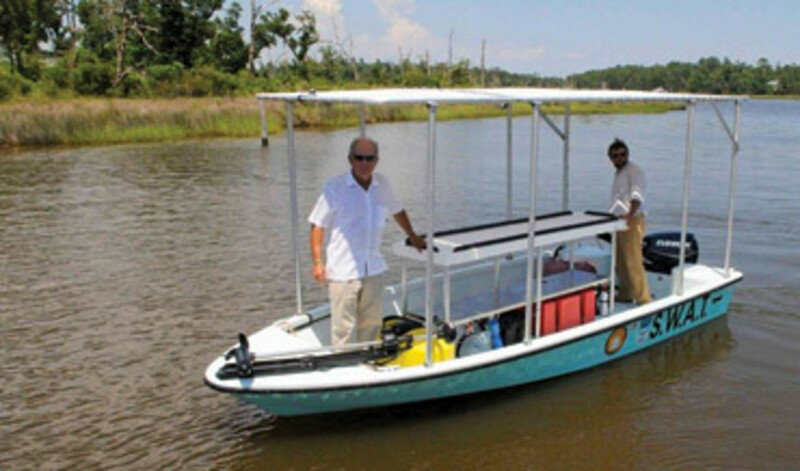 Essentially, Fish and Wildlife will be utilizing the boats." The second boat was headed to the U.S. Fish and Wildlife Service&apos;s Bon Secour National Wildlife Refuge, Castlow says. "We&apos;re just starting to build the third boat," says Castlow, who may well continue building SWAT boats after the fourth Buffett-funded boat is completed. "We have people throwing dinner parties, raising money that way," he says. "We&apos;re just going to build them as the need exists. It&apos;s good for the human spirit to know that people are rallying like this." The SWAT boats draw just 9 or 10 inches when loaded, and a bow-mounted electric trolling motor will let rescuers quietly approach wildlife. For primary propulsion, outboard manufacturer BRP is providing 40-hp Evinrude E-TEC 2-strokes. Garmin is donating GPS units for the boats. Motor Guide is providing trolling motors. Soft Lines is supplying dock lines. Castlow consulted U.S. Fish and Wildlife veterinarian Sharon Taylor to determine how the boats should be equipped. He initially thought the SWAT boats would serve as platforms for cleaning oil-soaked birds, so he planned to outfit them with two 150-gallon water tanks. However, Taylor told him to forget about the tanks because it takes 300 gallons of water to clean just one bird. "And they do the cleaning at varying [water] temperatures. It&apos;s kind of a complicated process," says Castlow. "I had no idea." That means the SWAT vessels are strictly rescue boats. The researchers will hydrate the animals and record their vital signs. Taylor also advised Castlow on the color of the boats. "I was going to paint the hull real bright orange or red, but she said that wouldn&apos;t be good because sometimes it&apos;s a signal of danger or a mating color to birds," says Castlow, a former part owner of Maverick, Hewes and Pathfinder boats. "Dr. Taylor suggested something easy and soft." He went with a sea-foam green. A work table mounted amidships is coated with a non-skid material to prevent the animals from slipping. "These birds will be highly stressed, so we don&apos;t want to cause more stress," Castlow says. Knowing the work will be done in heat that can be extreme, Castlow equipped the SWAT boats with solar fans and a misting system. 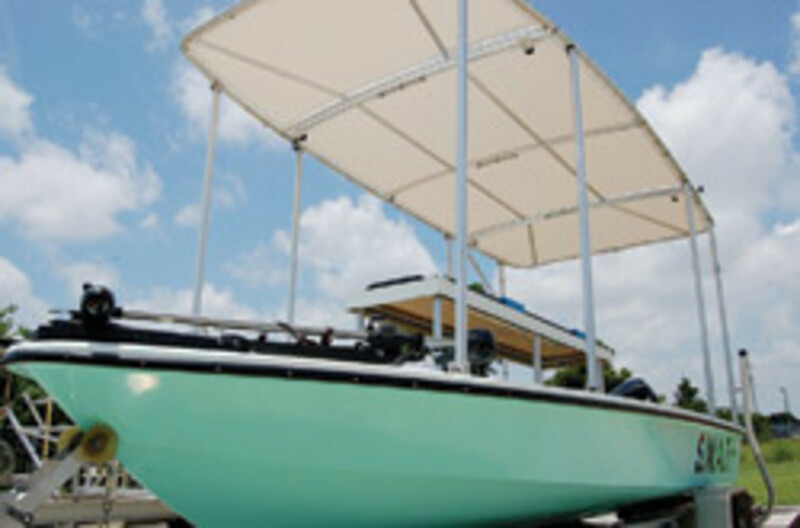 A collapsible canopy shades the entire deck. The boats also will have laptops and webcams on board, so anyone with an Internet connection will be able to watch the work in real time, Castlow says. Castlow has put his Dragonfly business on the back burner to focus on production of the SWAT boats, and that&apos;s OK with his customers waiting for boats. 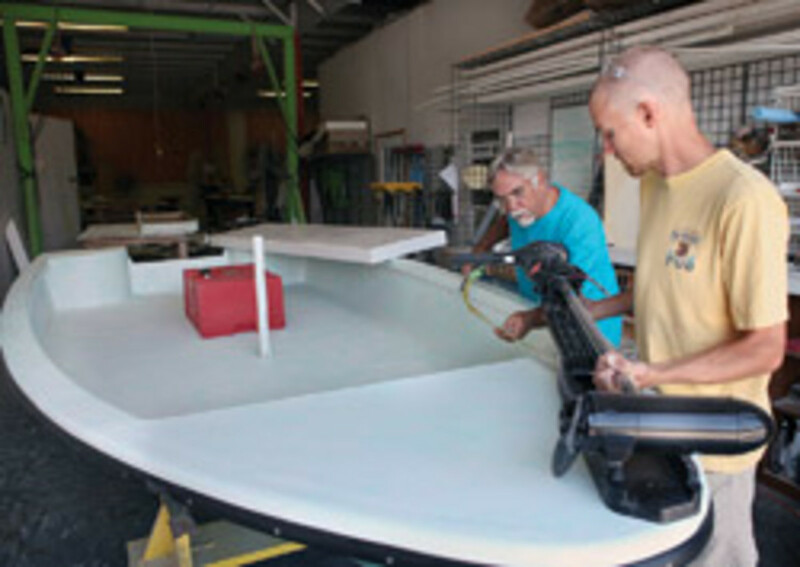 Dragonfly builds 16- and 17-foot shallow-water boats and kayaks. "I would love to have my boat, but this is more important," says John Huryn of Vero Beach, whose Dragonfly 17 is under construction. "They have started laying up the hull of my boat ... but I can wait. I know [Castlow] has more rescue boats to build. "Mark is very passionate about this," Huryn says. We&apos;re all sitting here feeling pretty helpless and it&apos;s nice to see somebody doing something to help." The SWAT project gained significant media attention thanks to Buffett&apos;s involvement. A distributor for the manufacturer of an oil-eating substance called Baad Bugs contacted Castlow after reading an article about the project. Scott Holmes, principal of Fort Pierce, Fla.-based MIHI Advisory Group, demonstrated the product to Castlow, Meador, Buffett and two other Dragonfly employees - chief financial officer Kenny McLean and his son Charlie, the customer liaison. Baad Bugs contains naturally occurring microbes that consume a variety of oils and oil byproducts, leaving behind carbon dioxide and water, according to Holmes, who says the microbes were used during the cleanup of the Exxon Valdez oil spill. Dragonfly Boatworks has bought 500 gallons of Baad Bugs and plans to use its own demo boats to disperse it in the oiled marshes and estuaries of the Gulf Coast. "It seems to be with this oil spill, everyone has these ideas, but nothing&apos;s being done," Meador says. "But here&apos;s one that&apos;s been approved by the EPA, comes naturally out of the Gulf of Mexico, has no adverse effects on the environment. It eats oil until there&apos;s no more oil, and then it dies. What more could you ask for?" Meador and company know their efforts are just a small part of cleaning up the worst man-made environmental disaster in U.S. history, but "every little bit helps," he says. "Instead of pointing fingers, we wanted to lend a hand. If everybody has got that attitude, then we can whip this thing."